The watercraft operates quietly and doesn’t produce any waves or emissions, which makes it suitable for lakes, rivers, seas as well as marine protected areas, where most motor boats and personal watercrafts are prohibited. It has a top speed up to 40 km/h (21 knots) and a range of up to 100 km (54 nautical miles) and can be fully charged in under 2 hours. Quadrofoil is ready for production and available for pre-order worldwide as of October 2014. The limited edition first series is due to be shipped in March 2015 on a first come, first served basis. 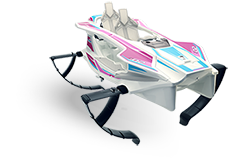 A patented, integrated steering system makes your Quadrofoil experience simple and exciting. The technology also works as a stabilization system and makes the vessel responsive on the water and prevents drifting. 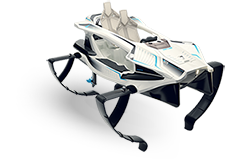 Quadrofoil is designed to be almost unsinkable due to its airtight top module and foil hydrodynamics that create automatic balancing and stabilization. 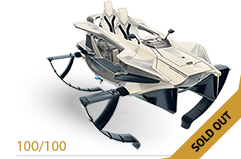 When airborne at 12 km/h it flies over water and with ergonomic and soft seats premium comfort is achieved. Quadrofoil is a high-tech development company with a team of skilled engineers, nautic enthusiast and visionaries, who design and manufacture the world's first fully electric and completely environmentally friendly hydrofoiling personal watercraft.